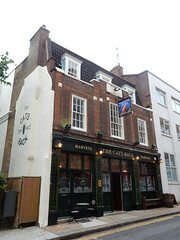 Harveys pub in Wandsworth, in the Good Beer Guide. It's a a small space, wrapped around the bar and probably seating around 30 people in total. A U-shaped banquette is tucked away at one side, and a couple of small two-seater sofas face each other across a coffee table photo. The front windows are frosted with Harveys logos, the floor is hardwood, and a piano sits in one corner. There's a decking area out the back (not covered), and a couple of seats out the front on the pavement of a quiet back street. A function room upstairs is used for regular film showings. Kake and bob visited on a Saturday early evening in August 2015. There were about a dozen other people in, and lively conversations going on, helped by the very friendly and enthusiastic staff member on duty. Music was playing, not too loud. There were four real ales on, all from Harveys: Armada Ale (£4/pint), Lewes Castle Brown Ale (£4/pint), Sussex Best (£3.95/pint), and Sussex Wild Hop. Food is served, including bar snacks such as sausage rolls and charcuterie, though we're not sure what times. Kake's cheese and herb croquettes (£4.50) photo were pretty good, with a prominent though not overwhelming flavour of dill, and a nice loose texture. The accompanying tomato chutney was quite sweet, though this worked OK in context. Kake's verdict: I'd definitely come back if I was in the area. Accessibility: A small step to get in, though no more than 2 inches if that. Accessible toilet on ground floor though no sign on door. Other toilets are in the basement and on the first floor. Last visited by Kake and bob, August 2015. Opening hours taken from the Cat's Back website, August 2015. Last edited 2019-01-12 08:47:12 (version 6; diff). List all versions. Page last edited 2019-01-12 08:47:12 (version 6).